A couple of weeks ago I mentioned how much I enjoy using baskets for storage and organization around the house. One of the most-used baskets is our library book basket. From the time that our girls were very small, a visit every week or two to the library has been a part of our schedule. Because we have a large number of books on our own bookshelves, I knew from the beginning that I needed to have some kind of a plan for keeping the books we checked out from the library separate from those that we own. 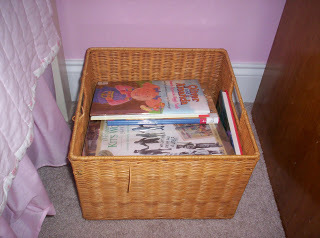 A basket became the perfect solution, especially when they were young, since the books can be easily taken out for looking at or reading, then put back in when they’re finished with it. After doing this for years, the girls are well-trained in having books from our public library kept in the designated basket in their room. It certainly makes things go smoothly when it’s time for a trip to the library. All of the books can be gathered from one place and I am certain that having them in that basket has spared us a few late or missing book fines! Organization and saving money at the same time definitely works for me! Stop by Works for Me Wednesday for more tips. I may have to try this one. I've been keeping our library books in a designated place, but I'm positive that it's been sheer luck that has kept us from losing one thus far. Great idea! I too have a seperate place for all of our library books. I like that basket! Great shape for dealing with books…where did you get it from? I am always trying to figure out what to do with my kids books. Thanks for sharing this! Very good idea!!! I definitely need to implement this into our home. I have a giveaway going on for Works for Me Wednesday on my blog for a Couponizer… if you don't know what that is it's definitely worth checking out!! I'm sharing the solution for stinky towels in my WFMW post today. Thanks for adding your link to my tips. Keep checking, we may use it next Wednesday! !